In the wake of last week’s mass murder in Charleston, SC, amid the usual calls for gun control has come a secondary demand that South Carolina remove the Confederate flag from the statehouse grounds in Columbia. For perhaps the first time, conservative Republicans such as South Carolina Gov. Nikki Haley and Senator Lindsey Graham have joined the calls to remove the flag. As a lifelong Southerner and staunch conservative, I agree that the time has come to lower the Confederate flag. I grew up respecting the heroes of the Confederacy. As a native Georgian, I learned family lore about my ancestors who had fought for the South, including one great-great-grandfather who was captured at the Battle of Spotsylvania in 1864 and then interned at the notorious federal prison camp in Elmira, NY. I still hold a great deal of respect for Confederate leaders such as Robert E. Lee and Thomas “Stonewall” Jackson. There is disagreement even on the nature of the flag in question. Some defenders of the South Carolina flag point out that it was not the national flag of the Confederacy. In reality, the rectangular “Southern Cross” was the Confederate navy jack and was similar to the Confederate battle flag. The flags of the Confederacy can be seen on USflag.org. Both the battle flag and the navy jack were a Confederate flags and, in the minds of most Americans have come to be the Confederate flag. Photos of the South Carolina flag appear to be the Confederate battle flag, a square version of the Southern Cross carried by the Confederate army. In the end, the exact version of the flag is irrelevant. Confederate apologists have long made the claim that the Civil War (which should more properly be called the War of Secession) was about state’s rights, not slavery. There is some truth to this argument. The rub is that the state right in question was the right to keep slavery, the South’s “peculiar institution,” legal. This is made abundantly clear in the declarations of causes passed by the seceding states. These declarations are available for review on CivilWar.org. One must conclude not only that secessionists were leaving the Union to protect slavery, but that they were proud of their pro-slavery stance. Given that the Confederacy was born to protect slavery, it is also a given that the Confederacy was a racist institution. Therefore, the Confederate flag must be a racist symbol. Proponents of the flag also argue that the United States flag must also be a racist symbol because Old Glory flew over legal slavery for longer than the Southern Cross. This statement is in error for several important reasons. First, slavery was never a federal matter. It was always subject to the individual states. A timeline of slavery by Mount Holyoke College shows that Vermont banned slavery with a constitutional amendment in 1777, one year after the Declaration of Independence. Other northern states had banned the practice by 1804. Additionally, the Constitution itself reflects American uneasiness about slavery. The Three-Fifths Compromise is often incorrectly interpreted to mean that the Constitution considered slaves to be three-fifths of a man. In reality, the Three-Fifths Compromise laid the foundation for the eventual abolition of slavery by providing a check to the power of the Southern slave states. Likewise, the Constitution granted Congress the power to prohibit the importation of slaves after 20 years, an action that Congress took in 1807 when it passed the Act to Prohibit the Importation of Slaves. In the South, even though slaves were no longer imported, the slave trade persisted as children of domestic slaves were separated from their families and sold to new owners. After the slave trade was declared to be piracy by Congress in 1819, the US Navy took an active role alongside the Royal Navy in bringing slave smugglers to justice and ending the slave trade in the Atlantic Ocean. In contrast with the Confederacy, the United States took strong action to hasten the end of slavery. Even though the American flag flew over slavery for almost 100 years, slavery was never the official policy of the United States. In the end, secession hastened the end of American slavery. The 13th amendment, which abolished slavery, was ratified on December 6, 1865, much earlier than it is likely to have been passed without the war. The racist association of the Confederate flag did not end with the war. The flag was raised above the South Carolina statehouse in 1961 to commemorate the 100th anniversary of the Civil War according to Daniel Hollis, the last surviving member of the centennial commission. Hollis doesn’t recall a racial motive behind the raising of the flag, but South Carolina politicians, mostly Democrats, were fighting against desegregation at the time. In fact, South Carolina’s delegates seceded from the national Centennial Commission to protest President Kennedy’s decision to move the ceremonies to Charleston’s navy base rather than exclude black delegates who had been refused entrance to the segregated Francis Marion Hotel. The brouhaha was referred to as the Second Battle of Fort Sumter. The South Carolina statehouse flag may not have been explicitly associated with segregation, but elsewhere the Confederate flag was adopted by anti-civil rights activists. The Georgia Encyclopedia notes that the inclusion of the Southern Cross on the Georgia state flag in 1956 was prompted by the Supreme Court’s Brown vs. Board of Education decisions in 1954 and 1955. Rep. Denmark Groover said, after the new Georgia flag was adopted, that it “will show that we in Georgia intend to uphold what we stood for, will stand for and will fight for,” a reference to preserving segregation. 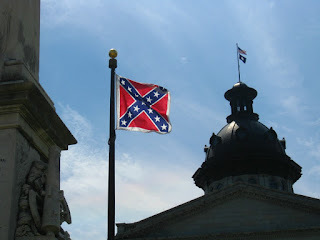 The South Carolina flag was moved from the top of the statehouse to a different site on the statehouse grounds as part of a compromise in 2000. The Georgia flag was changed in 2001. The best argument for keeping the Confederate flag is as a memorial for Confederate soldiers. An estimated 260,000 Confederate soldiers died in the war. This was almost five percent of the total non-slave population of the Confederacy. Another 194,000 were wounded and 31,000 taken prisoner. It is appropriate to fly Confederate flags at war memorials. It is not appropriate to give the flag a place of prominence on the state capitol grounds or on a state flag. The bitter truth is that Confederate soldiers, even the majority who did not own slaves, fought to preserve a racist system, even as they were protecting their homes. After the fall of the Confederacy and the abolition of slavery, the flag became the symbol of racial segregation in the form of “Jim Crow” laws and “separate-but-equal” treatment of blacks. As such a racist symbol, the Confederate flag has no place in a modern American government. This is not to say that the Confederate flag should be banned. Freedom of speech dictates that people should have the right to fly the flag on private property, wear it on their clothes or paint it on their cars a la “Dukes of Hazzard.” It would also be improper to attempt to erase all vestiges of the South’s Confederate history from society. Slavery, the Confederacy and the Civil War happened and that history should be openly acknowledged and discussed. There is a vast difference, however, between a state government endorsing the Confederate ideals by prominent placement of the flag and flying the flag at a memorial or displaying it at a museum. By keeping such a divisive symbol, states marginalize 30-40 percent of their populations. If the flag keeps alive the memory of Confederate soldiers, it is fair to say that it also keeps alive the memory of slavery and Jim Crow for black Southerners. It hearkens back to the 1960s when Klansmen could murder a black army officer, as they did not far from where I grew up, and all-white juries would unanimously acquit the killers. Bringing down the Confederate flag would be an important step in putting this racist part of our past behind us. An addition to being good for country, lowering the Confederate flag would be a good thing for conservatives. Democrats never miss a chance to imply (or state outright) that Republicans are racist. Quite often, conservatives step right into these liberal traps. To many minority voters, defending the flag of a 150-year-old failed racist nation makes conservatives seem like racists themselves. Conversely, hauling down the flag would remove a roadblock to increased minority participation in the GOP. If Republicans want to win future elections, they must find ways to reach out to minority voters rather than alienating them over trivial issues. In 2015, the Republican Party can either spend political capital trying to rehabilitate the Confederate flag, a lost cause in itself, or wooing minority voters. It cannot do both effectively. Opposition to the Confederate flag spreads across racial lines. Rasmussen found that by a three to one margin, voters oppose having the Confederate flag continue to fly in front of the South Carolina statehouse. Outside of white Southerners, themselves a minority, support for the Confederate flag is thin. South Carolina’s Confederate flag will come down, whether now or in the not-too-distant future. If the flag, hoisted by Democrats in both 1861 and 1961, is taken down now, under the effort led by Governor Nikki Haley, a woman who is herself a member of an ethnic minority, today’s Republicans will be completing the job that was started by Republican Abraham Lincoln more than 150 years ago. The irony will be delicious.